With the title of this post, you may be wondering how those three things could possibly fit together. Well let’s go one by one. 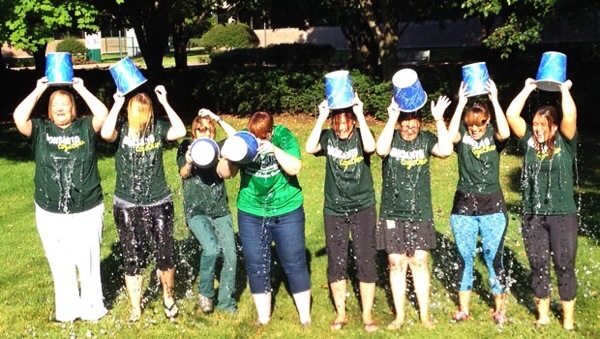 Seems everyone on the planet has been ice bucket challenged — I did it at work when a group on the marketing team at Organic Valley challenge Monsanto. It was a week and a half ago or so and several girlfriends at the office gladly joined in the challenge and we got our video up and the company encouraged employees to make a donation that the company would gladly match. In case you haven’t seen enough of these videos, here’s the one where I get all wet just before heading to the airport. And a photo that shows stop motion. When I saw the challenge though, I immediately knew I had to take them up on it. I had no idea how many people would want to help! People wanted specifics on how to join in person, virtually and through donations. We ended up having employees at multiple locations join in and several shared stories of personal connections to ALS. For me, when I did the challenge, I remembered a cousin of my mom’s had ALS and died too young. I hoped that part of the family feels a sense of support as they watch these videos pop up online. But I soon had several friends telling me of their personal tragedies with family members and that in and of itself was enough for me to feel good about doing the challenge when critics of the challenge surfaced. One of my closest cousins wasn’t feeling well when she was challenged so she didn’t quite make the 24 hour window. By the time she did it, she had been challenged three times! Yes, lots of people wanted to see her scream! She toughened up and did three 5 gallon buckets! Her pay it forward though, wasn’t to challenge people to dump ice water on her head. Instead it was to do a random act of kindness. Some small thing that could bring a smile to someone’s face. Maybe it is something as small as paying at the drive thru for the person behind you’s order. Maybe it is offering to take care of a young child when you know the parents need a little time. Whatever. 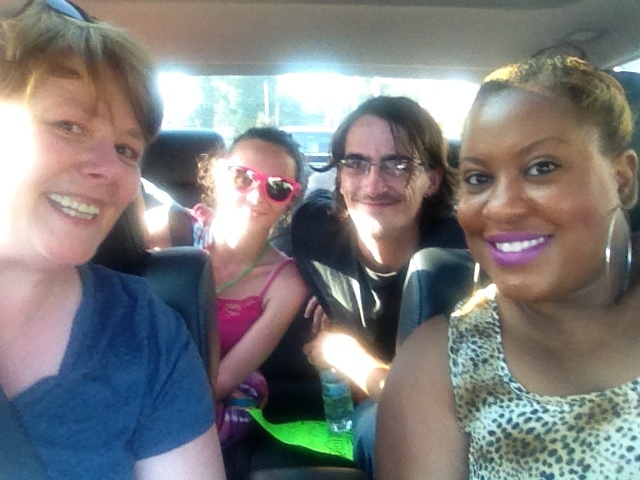 As some of you will remember, I went to Ferguson on Monday with my friend Danyelle Little of The Cubicle Chick. Each of us had a chance to write about that for BlogHer (a website that crowd sources content from bloggers around the country). Danyelle’s article “She’s White. I’m Black. 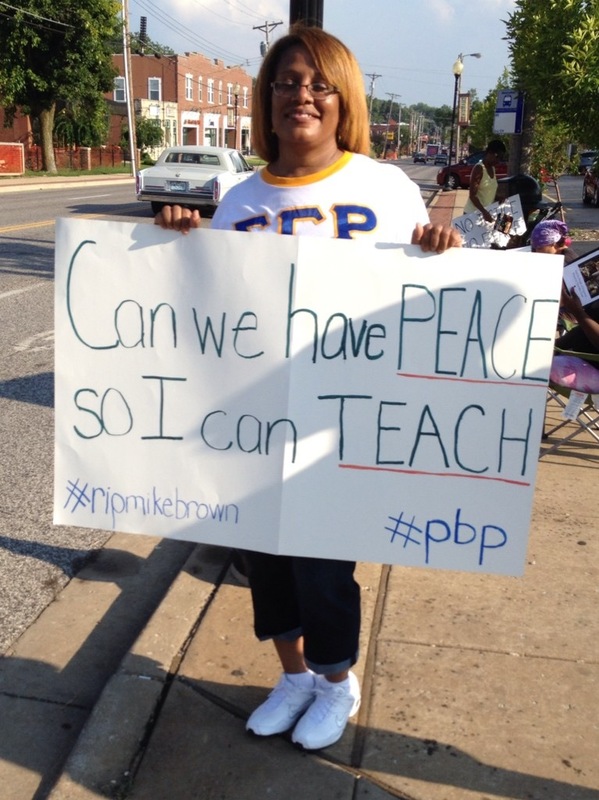 And We Marched in Ferguson Together” provided her thoughts. I encourage you to read the piece. Danyelle and I are both asking big questions about Ferguson and society at large… but for her the criticality of getting answers may be different as she worries about her son who is part of the demographic being stereotyped as aggressive or even dangerous. At one point, a young man handed us roses so that we could hold them up in Brown’s memory while marching. After a teenaged black girl saw our roses and proclaimed that she wanted one too, Janice handed her rose to her, which made the girl smile. And it made my heart dance, because Janice is just that type of chick; she’s is cool like that. She is selfless, and has been that way since I met her several years ago. I don’t put this here to beat my chest, but to show how a small act of kindness — one that cost me nothing & one I forgot — can leave a lasting impression. Another lasting impression from Ferguson? In my BlogHer article, you will learn about the mom / teacher who I stood alongside for 30 minutes or so. I asked about the school she taught in and how things were going. As we talked, I tried not to fixate on her son but he seemed so familiar to me, like a child who’s high school graduation I celebrated in the spring as my nephew and his friend Cordele graduated. They were still in my head when I got an email today from Donor’s Choose letting me know that the Bill and Melinda Gates Foundation had pledged a million dollars to match donations that come in this weekend. I checked for a few things…. one I wanted to see if my sister had any outstanding projects (and she doesn’t) and secondly I wanted to be part of the moving forward in Ferguson (and it is clear I am not alone). I helped complete a Ferguson project to get technology in the classroom for use with history instruction, something that those students can help us move forward on. There are lots of schools in this highest poverty rating, like some areas of Ferguson, that have projects out there waiting for funding so people in their community can make a positive difference working with kids. Please think about doing something small to help these teachers who participate with Donors Choose help their own communities. It may be a random act of kindness that makes a real difference for a student somewhere.